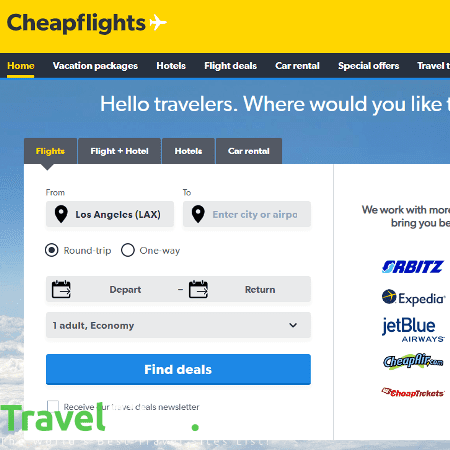 It’s always great to have access to useful travel tips and inspiring ideas for trips, and this is where Cheapflights comes in handy. Their travel blog is an ideal resource for those needing some inspiration or perhaps frequent flyers looking to make their journey just that little bit more comfortable. In terms of booking flights, the website is very similar to its competitors. On its homepage you can easily enter the details of your travel itinerary or, if you’re not sure where the nearest airport is to your destination, tick nearby airports. However, rather than just taking you through to a page displaying various results, a new window opened that took me through to the metasearch engine, Kayak, with results for hotels in the location I was flying to. Not only did this feel intrusive, it was unnecessary as I was using the site to book flights and not accommodation. You also have to untick the box ‘Compare sites vs. Cheapflights’ if you do not want another tab to open that will take you through to justfly.com. After clicking ‘View deal’ on a flight I was interested in, yet another new tab opened, this time taking me through to eDreams.com, as you cannot book directly through the website. That being said, there were lots of filters to choose from on Cheapflights.com, as well as the ability to be notified by email if prices on the flights you are looking at change. Unfortunately, the site does not display additional bag fees on bookings, meaning the price displayed is only a rough estimate. Their holiday deals are handpicked to offer good deals on package trips, however once again by clicking on the deal you will just be taken through to another booking site. Overall, a good website for travel information and tips, but in terms of comparing or booking flights, its poor.